As I've said before, I don't exclusively read YA or children's fiction, although this year has been heavily tilted that way. 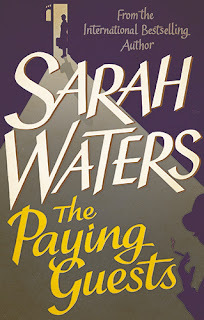 But I recently read The Paying Guests by Sarah Waters for Jenny's Bloggers Book Club which I really like joining in with. This is my first foray into Sarah Waters - I own a couple of her books but I've never actually picked one up. I've seen the TV adaptation of Tipping the Velvet, although only within the last couple of months. I started The Paying Guests not really knowing what to except - it's a heft of a book though - 600 pages of small writing! Frances and her mother are upper class people in 1920s London, living with the aftermath of the First World War and Frances' father's death and the debt that they've fallen into. They have a large house so they decide to rent out some rooms on their upper floor. Mr Leonard Barber and his wife Mrs Lilian Barber rent out the rooms; they are part of the "clerk class". Frances and Lilian become friends and eventually start an affair. It turns out that Frances previously had an affair with her friend Christina, which scandalised the family and which means that she now feels she must stay with her mother. The women discuss leaving together, but one night everything goes wrong and they must deal with the aftermath. I found the first part of the novel incredibly slow going. I know that Waters was setting up character and motivation and stuff, but GOSH, I found the first 200 pages very hard. It took 220 pages before Frances and Lilian kissed for the first time! But once that happened, the book really picked up pace. I felt like it dragged a bit at the end, too, but without spoiling the plot I will say that it did fit with what was happening. What's it about? See above. What age range is it for? 18+, parts of it are quite explicit and gory. Are any main characters LGBTQ+? Yes, I mean that is quite the premise. It's not talked about in such terms, though. Frances, when telling Lilian about Christina, merely says they were "friends". Is there any talk of death? Yes, it is a bit gory. Would I recommend the book? Yes, definitely. Loads of people have always recommend Sarah Waters to me and now I know why. How many stars? 8 out of 10, it was definitely a well-written and crafted novel. Where is the book going now? I'll keep it, it's a gorgeous cover!